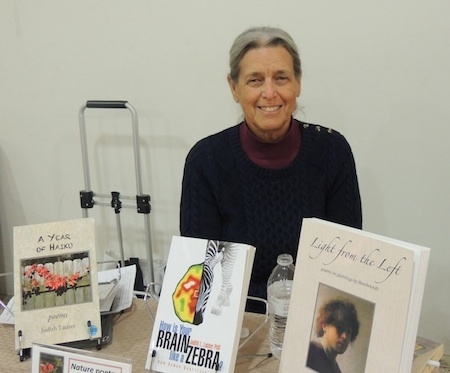 (1) Invited speaker, 6th Annual East Texas Book Fest, Tyler Junior College West Campus, Tyler TX, Saturday September 13, 2014, 10 am - 3 pm: I gave a short presentation on my Zebra brain model, and offered all my books for sale, including my poetry books. The Fest this year was co-sponsored by Humanities Texas, where I am listed in the Speakers' Directory. 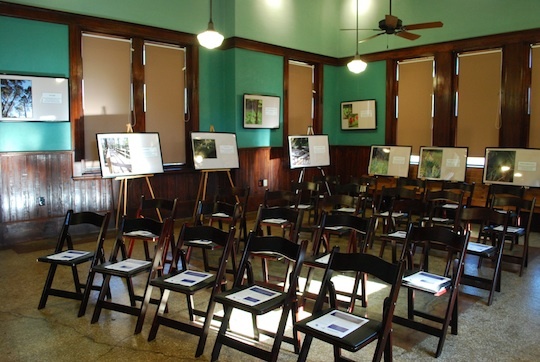 (2) Pineywoods Summer Haiku -- a gallery exhibit of photographs and poems from this book, at the historic Nacogdoches Railroad Depot, 101 Old Tyler Road, downtown Nacogdoches TX, October 1 - November 7, 2014. Exhibit hours during the run: M-W 11:30 - 3:30, Th by appointment, F 9-1; opening reception, reading, and book signing: 6 - 7:30 pm on Friday, October 3; workshop "How do you do haiku?" originally scheduled for Oct. 18 was cancelled. [For the image gallery below, click on any one to enlarge, then hover over right or left sides, to see navigation arrows for moving through the set.] 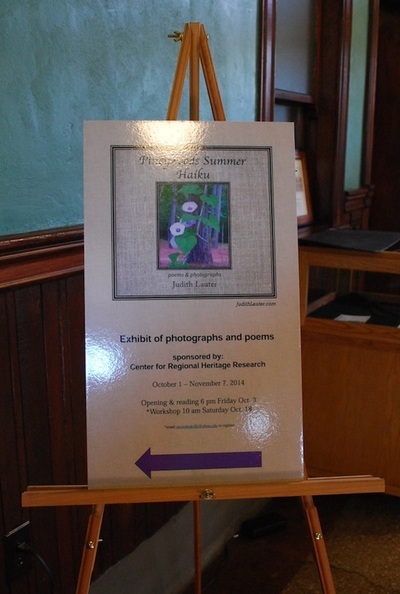 Also, to see a brief slideshow of selections from the exhibit, click here. (1) Invited author, "Blaze a Trail with Ab," dinner honoring Dr. Francis E. "Ab" Abernethy, Banita Creek Hall, Nacogdoches TX, March 10, 2015. More than 400 people attended this function, organized by Diana Walker and colleagues, with speakers including Dr. Abernethy, Jeff Abt, Mayor Roger Van Horn, and others. Dr. Mark Sanders of the SFA Department of English was good enough to take the photograph included below, showing Dr. Abernethy and me in front of the event's book table, which along with my LaNana Creek Haiku, also featured Ab's book Let the River Run Wild, celebrating the Neches River to which Lanana Creek is a tributary. Dr. "Ab" Abernethy with me at the dinner celebrating his years of work on the trails in Nacogdoches, Banita Creek Hall, March 2015. 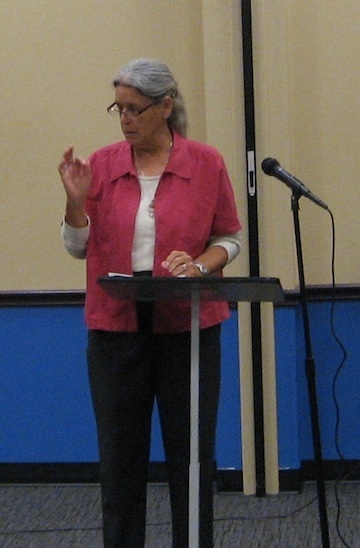 (2) Participating author, Dogwood Book Festival, Palestine TX , March 28, 2015. Sponsored by the Palestine Public Library, 10 am - 2 pm Saturday 3/28. Table at the Dogwood Book Festival, 2015. 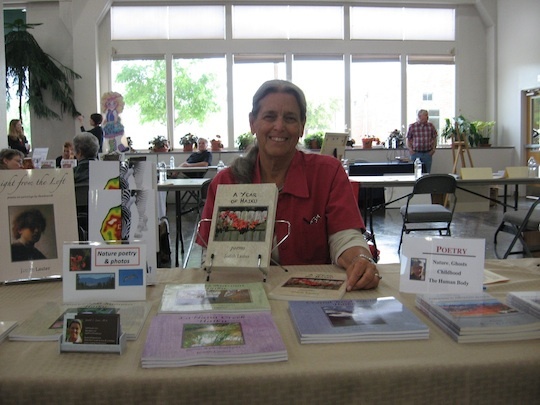 (3) Participating author North Texas Book Festival, Denton TX, April 11, 2015. Sponsored by North Texas Book Festival, Inc. www.ntbf.org. Held at the Patterson-Appleton Center for Visual Arts, Hickory at Bell, Denton TX, 9 am - 4 pm Saturday 4/11. Judy at the Center for Visual Arts, Denton TX. (4) Prize-winning author in the Judy B. McDonald Public Library Poetry Contest for National Poetry Month, April 2015. This was the third annual contest sponsored by the library, and this year a total of 17 entries were received. My previously unpublished poem Trees Sleep, Too received 2nd prize (my husband Ken Lauter won first prize with his previously unpublished poem titled Trailblazer -- for Dr. "Ab" Abernethy [see my 2015 event #1, above]). All writers were invited to read their poems at the award event held at the library at 6 pm on (my birthday) April 30, 2015. Reading my winning poem in the library conference room. 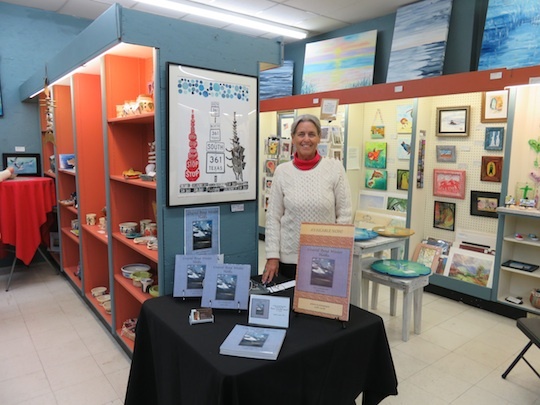 (1) Book signing, Art Center for the Islands, Port Aransas TX, Feb. 5, 2016. My book Coastal Bend Winter Haiku has been on consignment at the Art Center since 2014. At their "First Friday" reception on Feb. 5, 2016, I was invited to represent the book in person, for a sales & signing event. (2) Meet the Authors Open House, Daily Sentinel offices, Nacogdoches TX, April 26, 2016. 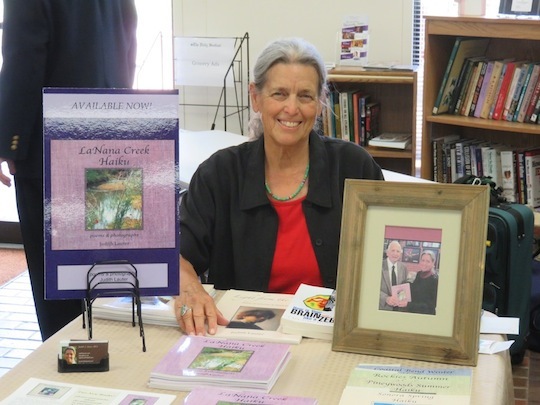 More than 20 regional authors participated in this well-attended event, which included local notables such as Joe Lansdale, George Avery, Barb Stump, Greg Grant, and Charlie Jones, representing the LaNana Creek Press. (3) ArtWalk, Longview TX, July 7, 2016. A consortium of art-related groups in Longview (including the Longview Museum of Fine Arts, which offers two of my books in their museum store) sponsor these events, which are held several times a year in downtown Longview, and feature various artists, musicians, and crafts demonstrations, set up around the downtown area. For the July 7 ArtWalk, Ken and I were assigned space in the Citizens National Bank, whose helpful staff offered us a spacious, air-conditioned area for our set-up, along with light catering. We shared the bank space with two other artists, both painters. Ken and I shared one table where we sold selected titles of our poetry books, plus I had a second table offering my photographs for sale, reproduced both as 8x10 prints and 5x7 greeting cards (for selections, see my page at FineArtAmerica.com). Approximately 50 visitors came through the bank during the 3-hr event, and perhaps half that number stopped at our tables. Our tables in the bank space; photos and cards are in baskets on the right. (4) Book reading with slideshow (Rockies Autumn Haiku), ﻿Shuter Library﻿, Angel Fire NM, August 19, 2016. 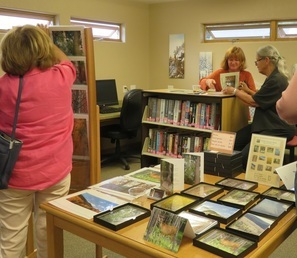 This excellent, independent regional library, with 501(c) status, offers a vigorous and up-to-date collection of books, magazines, audiobooks, and computer services to Angel Fire NM and the Moreno Valley. The library also sponsors a year-round series of activities including workshops, hands-on instruction classes for all ages, and book readings. I was invited to read my Rockies Autumn book accompanied by a color slideshow of the photos from the book; the images were displayed on a smart TV screen while the poems were read. 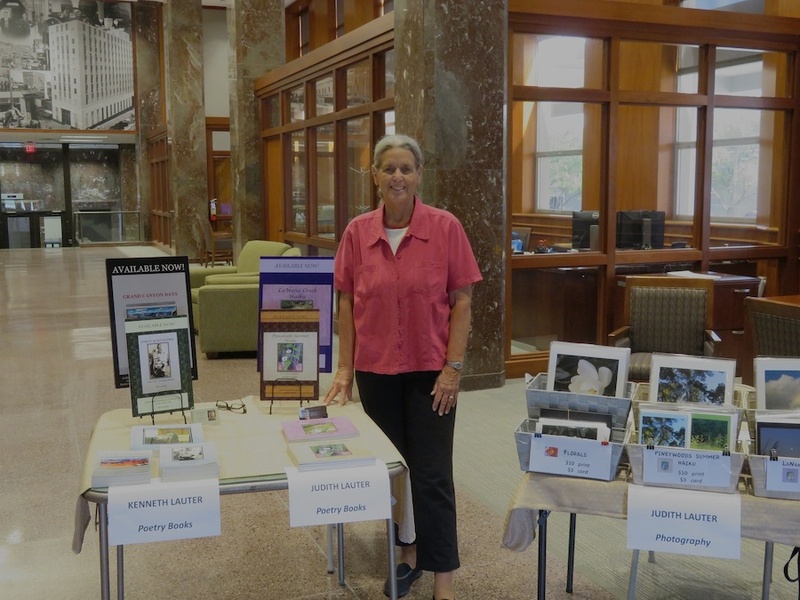 In addition to offering books for sale at the event, I also had tables with 10 x 12 color prints of a selection of the photos from the book, plus color greeting cards of the same photos, each with its accompanying haiku from the book as an inside message. Reproductions of the images from this book, along with photos from my other books, are available at judith-lauter.fineartamerica.com in a variety of formats (prints, framed prints, note cards, phone cases, tote bags, etc.). Prepared for the reading: TV screen with cover image, laptop for controlling the show. Table with note cards in boxes; prints displayed in magazine rack to the left. (5) Book reading and slideshow: "Rembrandt and Vermeer: Two Dutch painters as seen by two Nacogdoches poets," Cole Art Center, Nacogdoches TX, Nov. 13, 2016. This reading was sponsored by the College of Fine Arts, Stephen F. Austin State University (SFA). It was a joint reading with my husband Ken Lauter, based on our two books about these painters: my Light from the Left; poems on paintings by Rembrandt (﻿LightFromTheLeft.com﻿), and Ken's Vermeer in Words, both Xlibris, 2013. (For more about Ken's book, scroll down on the ﻿poetry-book page﻿ at his website KenLauter.com; a photo of him at the reading is included in the listing for this event at his website, and a movie clip of him reading one of the Vermeer poems will soon be added to his author page at Amazon.) 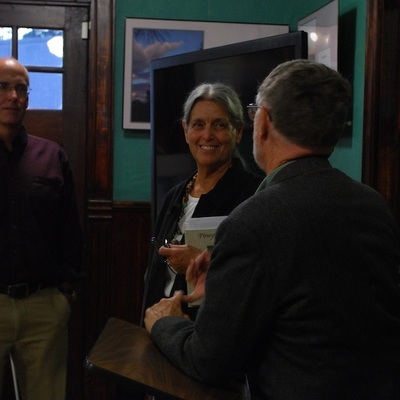 Eloise Adams, original director of the SFA Art Galleries, recommended we do this event; and John Handley, the current director of SFA galleries, agreed to host the reading, with a book signing to follow, at 2 pm, Sunday November 13, at the jewel of the SFA galleries, the beautiful Cole Art Center at 329 E. Main Street in Nacogdoches TX. Michael Tubbs, Gallery Preparator for the SFA School of Art, assisted with logistics; Cayla Mendow, an SFA Fine Arts student, designed the flyer (see leftmost image, below); and Trey Cartwright, Senior Media Producer for SFA Marketing Communications, recorded the presentation -- our thanks for all their support, and to our enthusiastic audience. (1) Book reading and slideshow: "Rembrandt and Vermeer: Two Dutch painters as seen by two Texas poets," SOMOS, Taos NM, Aug. 6, 2017. This reading was sponsored by the Society of the Muse of the Southwest (SOMOS), in their new home at 108 Civic Drive in Taos, near the historic Taos Plaza. Like the presentation listed just above, from Nacogdoches in November 2016, this was a joint reading with my husband Ken Lauter, based on our two books about these painters: my Light from the Left; poems on paintings by Rembrandt (﻿LightFromTheLeft.com﻿), and Ken's Vermeer in Words, both Xlibris, 2013. (For more about Ken's book, scroll down on the ﻿poetry-book page﻿ at his website KenLauter.com.) 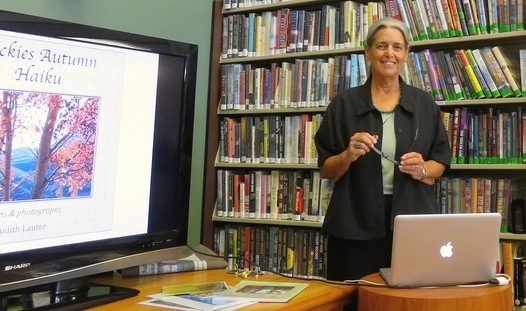 Jan Smith, SOMOS Director, suggested we use their 70-inch smart TV for the reading, and our slides truly looked grand on that big frame. Jan was more than generous with her time and enthusiasm before, during, and after the reading, and we want to thank her for making this one of our best presentation experiences ever. (2) Book reading and slideshow: "Just Back from the Mountains: Two Nacogdoches poets visit northern New Mexico and southern Colorado," The Bosslight Bookstore, Nacogdoches TX, Oct. 7, 2017. Tim Bryant at Bosslight has several of our books on his shelves, and invited us to read from our two books about this beautiful part of the country -- my Rockies Autumn Haiku, and Ken's New Mexico Notebook; Late Summer in the Mountains (for more about Ken's book, scroll down on the ﻿poetry-book page﻿ at his website KenLauter.com). We alternated reading selections, which the audience really seemed to like, and as usual in our recent readings, the poems were accompanied by a slideshow (shown on a big-screen TV) of my color photos from the many trips to the region we've taken over the years. Judy, Tim Bryant, and Ken in front of the Bosslight on E. Main, just before the reading. Along with both our books, I also offered the greeting cards and color prints of photos from my book for sale after the reading. (3) Poetry reading: poem "Esperando" (in Spanish), for the Evening of International Poetry event sponsored by the Stephen F. Austin State University Department of Languages, Cultures, and Communication, Nov. 8, 2017. This was the 3rd year for this event, which is open to the public and attracts submissions from SFA students, faculty, and members of the community. I read my poem "Esperando" ('Waiting'), and Ken read his "Poema para mi esposa" ('Poem for my wife'). This year the event was held at SFA's Cole Art Center located at 329 E. Main in historic downtown Nacogdoches. The organizers selected nineteen poems to be read, representing Spanish, Portuguese, French, German, Polish, Vietnamese, and Rumanian. Eight of the speakers read their own poems, while eleven read from other authors; several presenters were accompanied (or accompanied themselves) with live music related to the poem. The very enthusiastic audience numbered about 70, and the organizers invited Ken and me to return next year. Screenshot from the video of my reading. (1) Poetry reading: my poem “маневры” ('Maneuvers,' read in Russian), for the Evening of International Poetry event sponsored by the Stephen F. Austin State University Department of Languages, Cultures, and Communication, Nov. 13, 2018. This was the 4th year for this event, described more fully in the entry just above for 2017. My poem described some of my experiences while studying Russian during high school and college, and Ken read a poem in Spanish by Juan Ramon Jimenez. This year the organizers selected twenty-six poems, representing 12 languages: Spanish, Portuguese, French, German, Polish, Japanese, Afrikaans, Latin, Classical Greek, Romanian, Polish, and Russian. Eleven of the speakers read their own poems, while fifteen read from other authors. I was especially thrilled to hear the presenters in Latin and Classical Greek, as their readings definitely brought those 'dead' languages into vivid, colorful life. The exuberant audience numbered about 80, and the organizers invited Ken and me to return yet again next year. Screenshot from the video of my reading in Russian.